Have you ever tricked anyone coming over for dinner? Well, Chato and Novio Boy did. In Chato Goes Cruisin‘ Chato and his friend were making food all afternoon. Chato invited the mice for dinner to trick them. The mice were his neighbors. Then the mice brought a dog. Then Chato and Novio Boy had problem because they were scared of dogs. Uh! Oh! My favorite part was when Chato said, “all right neighbors.” Then the mice brought a dog. Chato ran and cowered under the dining table. I recommend this book to people who like funny things. It is funny when Chato said, “all right neighbors” then dropped their stuff and ran. 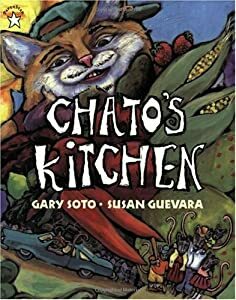 Also I recommend this book to people who like Chato books.